Parents who have adopted the trend in using social media are aware that once they post, it can be seen by all and everyone is free to comment and criticize. Especially if they are famous such as the wife of "pambansang kamao", Sen. Manny Pacquiao. However, one cannot simply turn a blind eye once your family's reputation is at stake. But you cannot also let anger get a hold of you unless you want netizens bashing you for a long time. 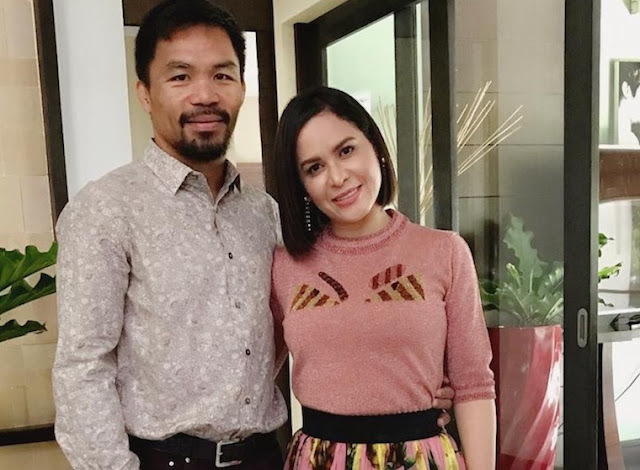 So when Jinkee Pacquiao was faced with the same dilemma, she certainly put the basher in place with grace and style. One cannot help but give a slow clap to her sassy remark. We've adored Ms. Jinkee not only as the supportive wife or her fashion style but also because of her huge heart. She's not only a loving mom but also thinks of the needy. So when her post - a photo of her son Michael and Jimuel who was wearing a Gucci ensemble - became a target for bashers, the fierce momma had to do something. It is apparent that she posted it with adoration for her young boys, I mean, just look how handsome they are! Yet certain bashers just can't help it if they sprout words that aren't nice. 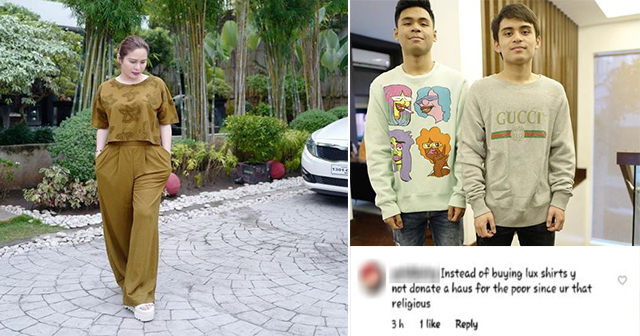 According to the post, "Instead of buying lux t-shirts, y does not donate a haus for the poor since ur that religious." 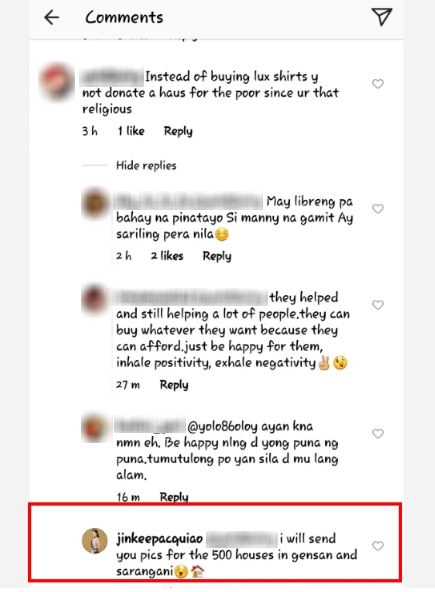 Of course, her fans reacted and pointed out that Ms. Jinkee was indeed helping the poor and had already built houses for them. The Pacquiao couple had already established a "pabahay foundation" in General Santos City, but the basher might have overlooked that. However, Jinkee reacted a sassy comeback of her own in which the fans superbly adore. She replied, "I will send you pics of the 500 houses in gensan and Sarangani." The couple truly stands as an inspiration to all with their "from a rags-to-riches story," they were still able to help the people with their simple efforts. Sometimes bashers bring out the worst in us, but better do it like how Ms. Jinkee did, and not let anger type unforgiving words. So that and they will certainly eat their words back. Kudos to you Ms. Jinkee.